History | Rainbow Division Veterans Memorial Foundation, Inc.
42nd (Rainbow) Division was activated in August 1917 and arrived in France that November. 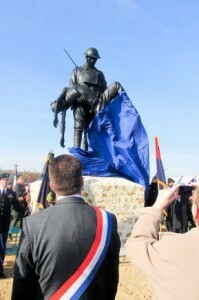 During its time in France the Rainbow Division participated in six major campaigns and suffered over 50% casualties. Following the end of WWI, the officers of the Rainbow Division formed the Rainbow Division Veterans Association and established the second week of July as the date for annual meetings – to coincide with the anniversary of the Battle of the Champagne, which began on July 14, 1918, and was the turning point in the war on the western front. In 1971 the Rainbow Division Veterans Memorial Foundation, Inc. was formed (today the Foundation does business as The Rainbow Division Veterans Foundation). The Foundation was granted tax exempt status as a 501(c)(3) non-profit organization in August 1972. Don Glossbrenner, a Past National President of the Association, promoted establishment of the Foundation to preserve existing 42nd Division memorials, establish new 42nd Division memorials and establish an education scholarship program. 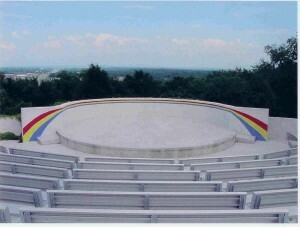 The Foundation suggested that the initial goal should be funding for an outdoor amphitheater in Muskogee, Oklahoma, in honor of Camp Gruber where the reactivated WWII Division trained before going overseas. On July 19, 2003, the Association and the Foundation merged assets and the Foundation continued as the only operating entity. In 2012 The Foundation revised its bylaws adding provisions to more actively invest its funds, establish new committees to support families of RDVF members, build in flexibility for decision making and update its operating capabilities through a first class website.